What is The Creature Project? 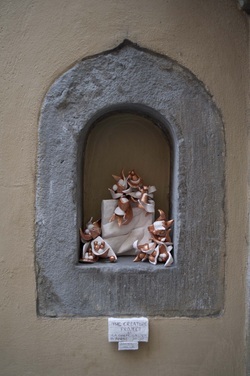 The Creature Project is a combination of multiple, ceramic self-exhibitions displayed in various locations throughout Florence, Italy during Spring 2015. As each self-exhibition is set up, photos and information about each location will be updated. The creatures will also make an appearance in my upcoming collaborate show at the La Corte Gallery in Florence, Italy from April 16th-April 23rd 2015. These "creatures" are beings that belong to the world of almostness. Each one resembles known objects in everyday life and yet, have a life and character of their own. There are endless different species that are native to different environments. What are the purpose of these creatures? To explain the purpose of the creatures, we must first discuss the relevance of almostness. Almostness is all around us. In the visual sense it is the portrait that looks almost like the person portrayed. It is the nearly ripe or overripe fruit in the supermarket. It is the partly sunny day. In a less obvious way, almostness is our everyday state of being. We are almost another year older. We are almost at the next stage of life. We are almost good enough for someone or something. Almostness falls just short of perfection. Because of this the word "almost" often has a negative connotation. This is where the importance of the creatures come in. The creatures--being physical examples of almostness--are created to be playful, elegant, and intriguing. They represent the beauty of almostness--the allure of imperfection and the potential to be more than a copy, something unique. Resembling objects that would naturally belong in the chosen environments encourages the viewer to appreciate what is there versus what should be there. I want to encourage the viewer to see the world in a different, more positive way. To consider the subtle differences around him or her that he/she may never have noticed before. To destroy each individual's idea of perfection. To not just accept, but appreciate the uniqueness we get as a result of almostness.